Last time I left off in the middle of the Pacific Ocean after traveling from Papeete, Tahiti, onboard the freighter Aranui 3 through the Tuamotu Islands, and spending a relaxing day at sea en route to the Marquesas Islands. Can you imagine what the early explorers must have felt after days, perhaps even months, at sea without sighting land? I had only been at sea for one day, but I was awakened this morning by anticipation. I climbed the steps to the top deck in the dark to catch my first glimpse of the Marquesas Islands and Ua Poa, the “cathedral island”, as it appeared through the emerging light just after 5:30 a.m. Sunrise was still over 30 minutes away. The peaks were wrapped in an ominous mist and stood dark and foreboding against the pastel bands of pre-dawn sky. The ship wouldn’t be in Hakahau for another hour. We skirted along the coast as the sky broke bright and golden over the high ridges of the headlands of Ua Pou. Bands of midlevel clouds with orange and red interiors were rimmed hot white when the sun broke free above the watery horizon behind us. A few other passengers now joined me on the upper decks to see the obelisk peaks and knife-edge ridges of Ua Pou bathed in golden light. A trio of peaks, which look like upturned baguettes, play hide and seek in the clouds above the village as we slowly entered Hakahau harbor. The scene before us looked painted to resemble what science fiction movies have taught us to expect a distant alien planet to look like. As the ship approached the dock, the green and white wooden whaleboat with two crewmembers aboard was set into the water by the freight crane. One of the sailors snags a line tossed from the Aranui and they take the line to shore. They repeated this procedure with multiple lines, towing each to the dock and lassoing the large metal cleats on the pier. The ship was slowly pulled in to the pier by the lines and the deft maneuvering of the captain. During breakfast several beautiful Marquesan women from the village performed softly swaying dances to the music from a trio of musicians. The women were adorned with feathers, shells, flowers, tattoos and vibrant blue and red floral, strapless dresses. The dance began in the methodical movements of their bare feet and resonated up through their knees and hips to become sensuous, undulating motions in their torsos, arms and hands, as they threaded their way between tables of breakfast-munching passengers. We had the morning on shore to explore the village, visit the church and cemetery, go to the beach, or take a forty-minute hike at a leisurely pace to reach the white cross that stands above the village of Hakahau. The view from the top was a fair reward for my efforts. Twelve peaks surround the village of Hakahau and many are the basalt pillar-styled summits that look like baguettes planted end-on into the island. Clouds drifted over the island, often getting hung up on the peaks. There is a cluster of three peaks that loom directly over Hakahau. I have been told it is rare to see all three of the summits at the same time, the highest of which rises 3,745 feet /1232 meters above sea level. Lunch was at Tata Rosalie’s Restaurant. We were welcomed by women and girls dressed in of belly-baring costumes and bare-chested men and boys in red pareu, a length of fabric tied in many unique ways to become the staple of island fashion for both men and women. The men and boys strummed guitars and ukuleles and pounded out staccato rhythms on drums while women and girls swayed, swirled and shook. When it is the men’s turn up front, they perform a fierce, chest-pounding warrior dance. Lunch was our first taste of Marquesan food, and it was a feast. Tables were filled with bowls heaped high with food. There was breadfruit, cooked red bananas, banana cuite, shrimp and cucumber salad, poison cru (raw fish marinated in lime juice and coconut milk), roast pork, goat curry, mixed vegetables, rice, oranges, watermelon and a couple of dishes I was never able to get a definitive identification on. I especially enjoyed the poison cru and the red bananas. The business of unloading and loading freight here at Hakahau delayed our departure by an hour. We would, therefore, have an abbreviated visit in the village of Hakahetau. We sailed past the undulating uphill runway of the Ua Poa airstrip with its towering backdrop of 3,000-foot peaks. Our stop at Hakahetau was a short glimpse into an even more remote part of Ua Pou. The shore near the whaleboat dock was littered with children in brightly colored clothes. Some were fishing, some were playing and some were playing at fishing, but one young girl in a Tahitian blue dress seemed the most serious about catching fish with a hand line. She eventually did bring in a small fish. Other kids were poking at an eel that lay motionless in a tidal pool. Eventually one of kids picked it up and posed proudly for photos. The crew unloaded provisions that this remote village needs to survive. We were back on board just as the sun set. There was time for a bit of rest before dinner. The Aranui arrived at the dock in Nuka Hiva in the early morning hours. I had awakened in the Bay of Taiohae, made famous by Herman Melville’s choice to jump ship here and then write the book “Typee.” We took a jeep tour that retraces the journey that twenty-three-year-old Melville and his accomplice, Toby Green, made to escape the tyrannical conditions on the whaling ship, Dolly. As I looked out at the peaks that rise above the sweeping, sheltered bay I tried to imagine what it must have been like for Melville and the crew of the Dolly to drop anchor in this bay in 1842. I tried to envision the canoes, manned by fierce-looking men, setting out from shore followed by schools of swimming girls headed out to greet the ship. Melville’s tale of life in the Marquesas Islands is certainly a romantic vision that is interrupted by the reality of life in Nuku Hiva today. There was construction on the dock adjacent to where the Aranui was berthed. The rat-a-tat-tat of a jackhammer cutting through concrete wiped thoughts of swimming nymphs from my head. I grabbed the last truck to town from the ship and found a swarm of four-wheel-drive vehicles amassed near the post office. Each vehicle carried up to 4 Aranui passengers, so it was quite a pack of trucks that would travel to the other side of the island. We made a quick stop at the Catholic Cathedral. This church, though of modern construction (1973-77), holds many detailed wood carvings made by local artists. One, “The Passion”, was carved from a single Temanu trunk. We stopped at a lookout on the high ridges overlooking Taiohae Bay, then resumed our journey over the top of the mountain ridge that separates Taiohae from the valleys that harbor Hatiheu and Taipivai. I stood on promontory point overlooking the valley where Melville was faced with a disturbing question nearly 170 years ago: Was the valley inhabited by cannibals? The caravan traveled down into the home of Melville’s sinister Typee (properly spelled Taipi) tribe in Taipivai valley. The trip is much easier in an SUV than it was for “Typee” protagonists, Tommo and Toby. Our next stop was the meae at Hatiheu. A meae is a ceremonial ground with several platforms. A giant banyan tree at the center was where the spiritual, sacrificial and ritualistic life of the Marquesan natives was expressed. The caravan stopped and we made a short walk to the meae where an immense banyan tree commanded the view. There was a platform around the base of the giant tree, and seated at the base of the tree were several bare-chested men with skirts made of bright green leaves. The men began to chant and dance in the mottled light beneath the banyan tree. This tree is at the center of ceremonial life for the residents of the area. This reenactment felt very real, and set the stage for a better historical understanding of what life was like before the arrival of the French. The area was dotted with stone tiki gods and immense stone platforms (paepae) where the Taipi built their houses. Petroglyphs of birds, sacred turtles and fish were carved on huge boulders, scattered among the trees. This meae will be the site of a quadrennial Marquesan Island festival in December 2011. Lunch was at Yvonne’s Restaurant near the beach in Hatiheu. Besides being the proprietor of the restaurant, Yvonne is also the mayor of Hatiheu. Yvonne’s is well known for its pig roasted in earthen ovens. We were invited to come to the back of the restaurant and witness the unearthing of our lunch. The dirt and hot coals were shoveled off and the smoke began to pour out. A layer of banana leaves was revealed and then removed. When the smoke and steam cleared, there in the earthen pit was our lunch: breadfruit, bananas and several pigs. The entire lot is lifted out of the pit by the corners of the burlap tarp by three men and carried to a nearby shed. It is set on a table where the process of sorting and cutting begins. It was time to buy a Hinano ($600 xpf ), wash up and relax until lunch was served. There was music but no dancing that time. Soon, handsome young Marquesan men and women began bringing bread, salad, fish, fried meats and shellfish to our tables in a Polynesian-style feast. I was already nearing capacity when the main event, the roast pig, arrived at the table… but there’s always room for roast pig! After lunch there were several activity options: a hike to the Anaho saddle, swimming at the beach, or taking an early jeep to Taipivai to visit another meae. The beach sounded perfect after a walk around the village. At the end of the road I found a spirited game of bocce ball being played by our drivers. It was an idyllic setting for a game of bocce, even though the pitch, which was the road, was a bit rough and added an extreme degree of unpredictability to the contest. We left Hatiheu and drove to Taipivai where we would rendezvous with the Aranui. I spent the last moments of daylight on the beach among the descendants of the Taipi, where Melville spent his last moments among them in 1842. The boats from the Aranui came to fetch us just as a whaleboat had come to rescue Melville, but I wasn’t sure I wanted to go. Back on the ship we had time to clean up before dinner. It seemed hard to believe it was time to eat again. There is a short but steep hike on today’s lineup sheet. At 8 a.m. I caught the truck to the starting point for the one-hour hike to what is called Belvedere. I have to say, this was one of the less inspiring hikes on the trip. It was more of a march on a rocky road that one might have easily driven up in an SUV, and the views are just not worth the effort. So, when one of my hiking companions remarked that maybe a more appropriate name for this place might be, “Vell, vee are here,” I concurred. If you aren’t in need of the exercise to work off the extra calories you have been devouring, give this one a pass. Atuona is the second largest town in the Marquesas and at one time was the home of two distinguished expats. The Belgian-born singer, writer and actor, Jacque Brel, made Hiva Oa and Atuona his home for the last years of his life. Before him, Paul Gauguin had arrived in Atuona in search of the savage lifestyle he found so wanting back in Tahiti. A visit to the homes of these two favorite sons was next on my agenda. The Calvary cemetery is situated on a hill above Atuona with nice views of the Taaroa Bay. Most of the graves gleamed with white headstones and crosses in the tropical sun; by contrast, Gauguin’s grave is comprised of dark, volcanic stones. The headstone is a replica of his Oviri statue. A charcoal-colored rock with whitewash painted into the simple shallow inscription, “Paul Gauguin 1903″, forms the footstone. A frangipani tree shades the grave and, in season, sheds fragrant blossoms over the shrine to the famous French painter. Brel’s grave is near the lower entrance to the cemetery on the left. His shrine is also simple and of somber colors with a relief-sculpted portrait of Brel and that of his mistress and companion, Maddly Bamy. The site is adorned with flowers, shells, necklaces and message inscribed stones left by visitors. It was a nice walk down into the center of town to the Gauguin Cultural Center. There are no actual Gauguin paintings there, but there are many replicas. A recreation of the House of Pain, sometimes called the Maison du Jouir or House of Bliss, is an interesting stop on the grounds for Gauguin fans. At the rear of the Gauguin Cultural Center is the Espace Jacques Brel / Jacques Brel Museum. The museum houses one of Brel’s twin-engine airplanes and mementos from his time in Hiva Oa. When the time came for the bus to Hoa Nui Restaurant, I wished I had had more time at the Gauguin Cultural Center and Brel Museum, and that I’d spent less time on the morning hike. But at least I had another strong appetite and, judging from the lineup of food on the tables in the restaurant, I needed it. What can I say about lunch each day? I can say that it was wonderful, there was always lots of it, and each day the dishes were a bit different. We had the rest of the day onboard while the Aranui sailed to the nearby Tahuata Island to deliver some freight. We had a chance to visit Tahuata later on in the voyage. Early to bed, early to rise early to rise, makes me ready for the day’s activity, a hike from Omoa to Hanavave on the Fatu Hiva. Those signed up for the hike got the first whaleboats to shore at 8:15 a.m. It was a 10-minute walk into the village and we had a couple of hours to explore in the village before we headed up and over the mountainous interior of Fatu Hiva. Fatu Hiva is a prime place for Marquesan arts & crafts items. There were tapa cloth designs for sale in the arts and crafts center near the post office. At the nearby museum there was a tapa cloth-making demonstration. The process involves the bark of mulberry, banyan and breadfruit trees being hammered out on logs. Once it is flat, it is dried and eventually painted with ancient and modern Marquesan designs. Fatu Hiva is also well known for its hand-painted pareus (sarongs) and monoi, a perfumed coconut oil scented with tiare blossoms and sandalwood. Outside the arts and crafts center, women making “umu hei”, the flower bouquets we’ve seen at other stops on our trip. The call went out for hikers to meet in front of the church to begin our trek to Hanavave. Those not going on the hike had an hour more in Omoa before they returned to the ship. Then, the Aranui would pull up anchor and sail north up the coast to Hanavave. I headed of north on foot , then west, then south, then east, then north again on a switch-back trail that climbs the high ridge spine flanking the west side of Fatu Hiva, the most southern, eastern and remote island in the Marqueas. I gained over 2500 feet of elevation and traveled 11 miles. The climb up the dirt road is steady, but manageable. I say without any shame, I was very glad to see the lunch stop. I drank a gallon of mango and orange juice, ate a pile of fruit… and then I ate lunch. We were treated to salads, rice, fish and meats. Today I earned every calorie. The middle part of the hike was mostly flat, rolling gradually along the crest of the ridge with dramatic views of the ocean to the west and the still higher ridge of peaks to the east. As we began to descend towards Hanavave, the vegetation became sparse. Maybe it was the mid-day sun, but the slopes were littered with Toitoi, a plant that looks like giant, wooly sheep against the vibrant verdure. The last descent into Hanvave was steep and treacherous at times with loose rock on the trail. I could see Hanvave below and hear the sounds of drums welcoming those from the Aranui that had not gone on the hike. But the insidious final section of the hike requires that I go three-quarters of a mile east before reversing course and walking a full mile back to the Hanvave. It was a great hike, and the shady, flat walk along the river that led into Hanavave was especially enjoyable. The hike did require a moderate amount of fitness, but plenty of time is allowed for you to go at your own pace and start and stop as you wish. I came upon one of the passengers from the ship sitting in the shade, drawing the landscapeacross the river. I began to see a few houses, then kids and soon I was in Hanavave. Once near the water, I found a party-like atmosphere. I heard rumors that the town had been out of both soda and beer for a couple of days, and it was obvious that everyone was glad to see the Aranui. A flock of little girls, dressed in bright colors, was seated on a mat ready for photos, while an athletic game of volleyball was played nearby. A group of children swam and played tag in the water near the dock. The boat from Aranui came to return us to the ship, now anchored in the Bay of Virgins. Before the arrival of the missionaries, the bay was known as the Bay of Penises, eponymously named for the phallic rock formations. The Aranui stayed anchored here in the bay to enjoy a glorious sunset. Rainy day - our first. The early-morning view of the return approach to Hiva Oa was through mist. The fog clung to the peaks behind the strip of beach that fronts the village of Puamau. Up the hill is the meae and archeological site I would visit after breakfast. We had a choice a 40-minute walk in the rain, or a 5-minute ride by car. I opted for the latter, as most do. It was a perfect day for visiting a place so rich in somber ritual and history. This meae, though not as large as some of the others we had visited, did have the distinction of having some of the grandest tiki. Megalithic tiki is how they have been described, and they do not disappoint. I posed beside one of them and I was dwarfed. The centerpiece rock platform and banyan tree are absent from this site. The banyan tree probably died centuries ago. Much of this site has been restored to what is thought to have been its original form. The tiki have been righted from their fallen postures and, in some cases, moved. While perhaps not historically accurate, this site is quite photogenic. A short walk back down the road from the meae toward the beach is the tomb of the last Marquesan chief. It sits in the yard of one of the Puamau residents. The stone-walled tomb is flanked by two three-foot, stone tikis that often have a panoplied roster sitting atop the carved stone columns. Behind the chief’s tomb is a corrugated-steel-roof shed with a near-new pickup truck and colorful steel barrels beneath. Nearby, a tethered baby goat bawls. Life goes on all around, and sometimes right on top of, the island’s revered ancestor. Puamau has a wide and soft sand beach. Many passengers of the Aranui took a swim, despite the rain. Lunch would be onboard the ship today. We’d be our way to another village on Hiva Oa. Hanaipia is just around the bend, so it wouldn’t take long. We were entering the second week of our cruise. Some colorful destinations lay ahead. 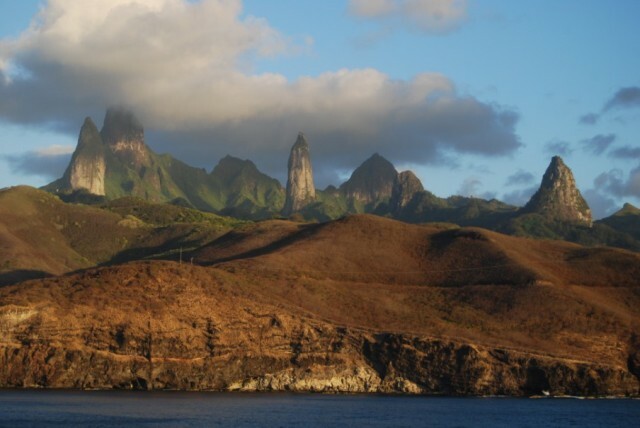 Join me next time as the adventure continues in the Marquesas Islands!